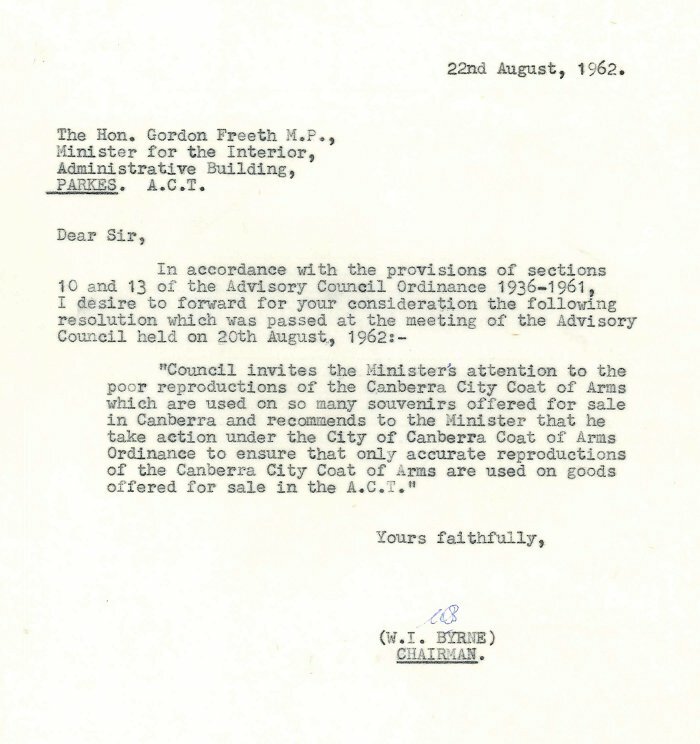 On the 1st July 2013, the Commonwealth Government presented the original grant of the City of Canberra Coat of Arms as a Centenary Gift to the Territory. While this significant document has remained in the care of the Commonwealth since its production in 1928, the Territory has always taken seriously its responsibility to protect such an important symbol. 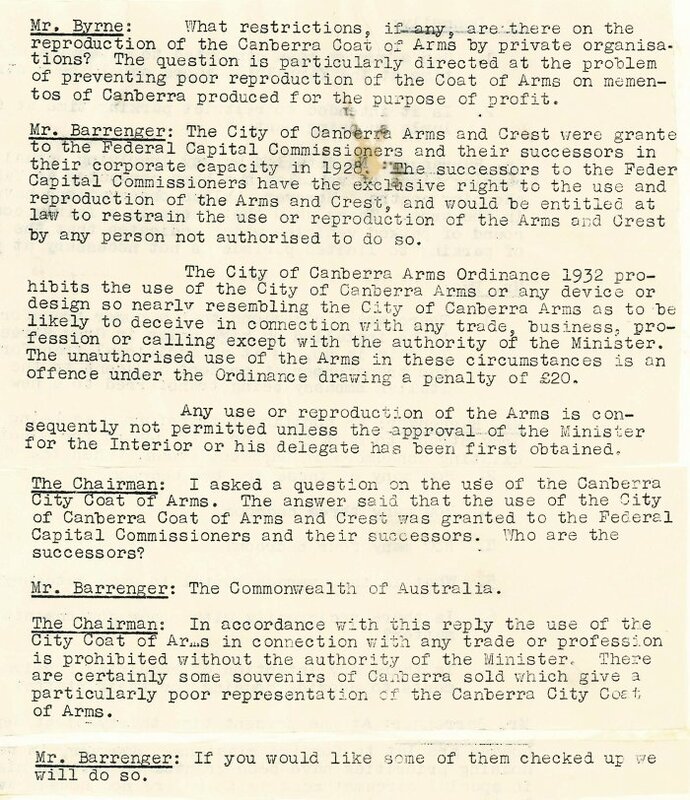 Rules about how the Coat of Arms may be used have been in place since Governor-General Sir Isaac Isaacs signed "An Ordinance For the Protection of the Arms of the City of Canberra" in 1932. 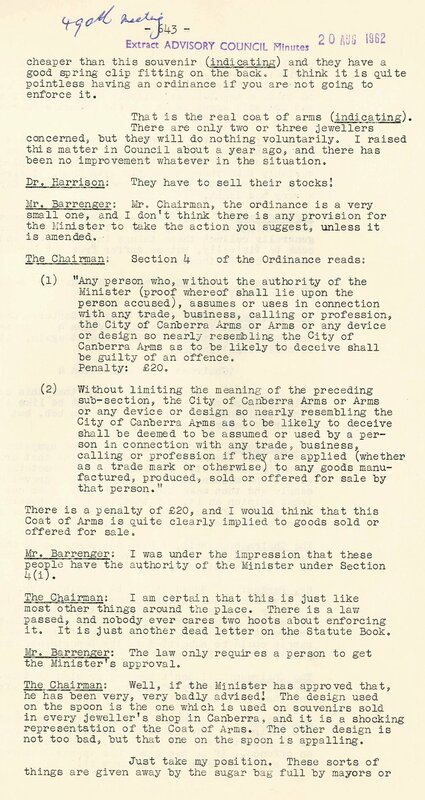 A file documenting the ACT Advisory Council’s concerns for the protection of one of the City’s key emblems is this month’s ArchivesACT Find of the Month. 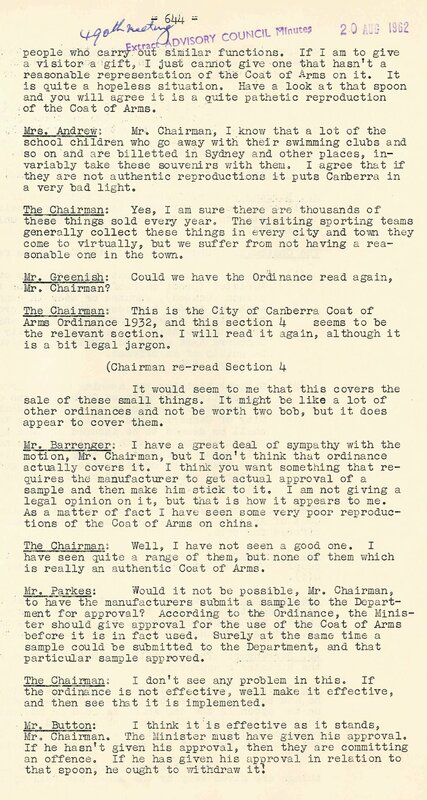 The file ‘1961/58 - ACT Advisory Council - Canberra Coat of Arms’ documents debate amongst ACT Advisory Council Members on the problem of “poor reproduction of the Coat of Arms on mementos of Canberra produced for the purpose of profit.” The issue was initially raised at the 472nd meeting of the ACT Advisory Council on the 17th July 1961 as recorded in the minutes below. A year later, Council Chairman William Byrne purchased two examples of souvenirs with representations of the Coat of Arms, and lamented to his Council colleagues that he had "found it impossible to buy anything which has, in my view, a reasonably accurate resemblance to the Canberra Coat of Arms". 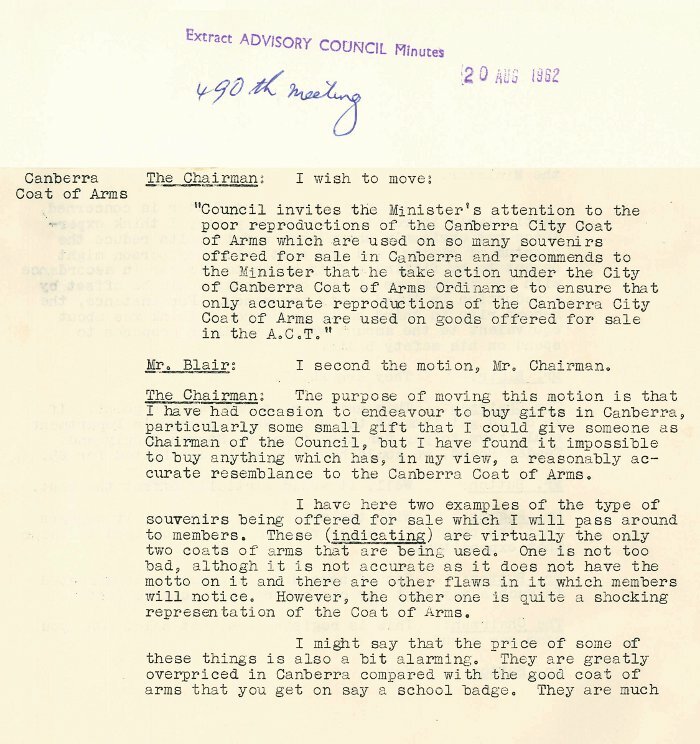 Other members agreed, noting that "if they are not authentic reproductions it puts Canberra in a very bad light." The Council resolved to draw the problem to the attention of the Minister. 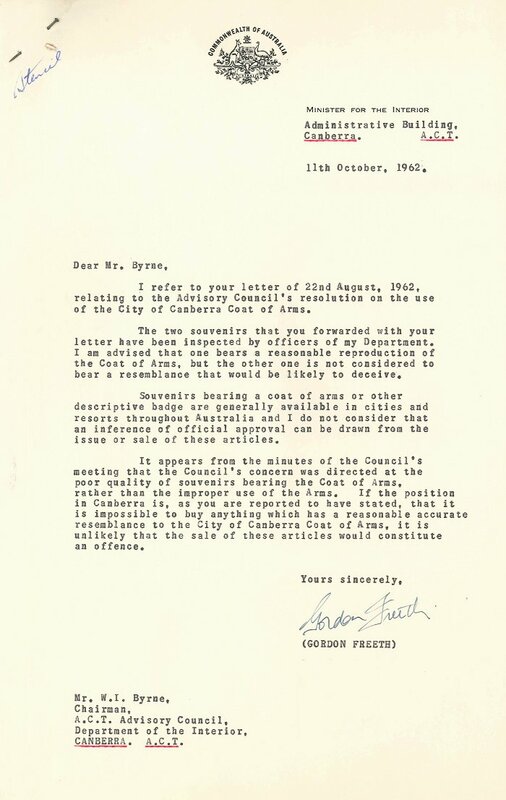 Minister for the Interior Gordon Freeth was responsible for Canberra, and its Coat of Arms, at the time. 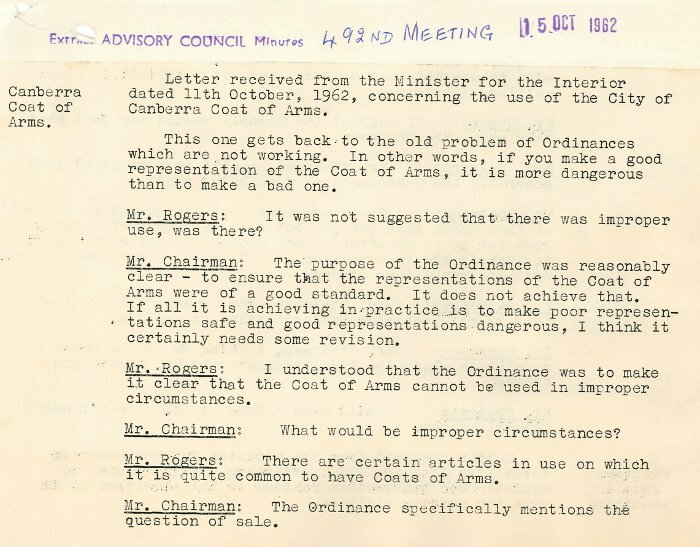 He noted that "if... it is impossible to buy anything which has a reasonable [sic] accurate resemblance to the City of Canberra Coat of Arms, it is unlikely that the sale of these articles would constitute an offence." This response left the Council members debating the purpose of the Ordinance. 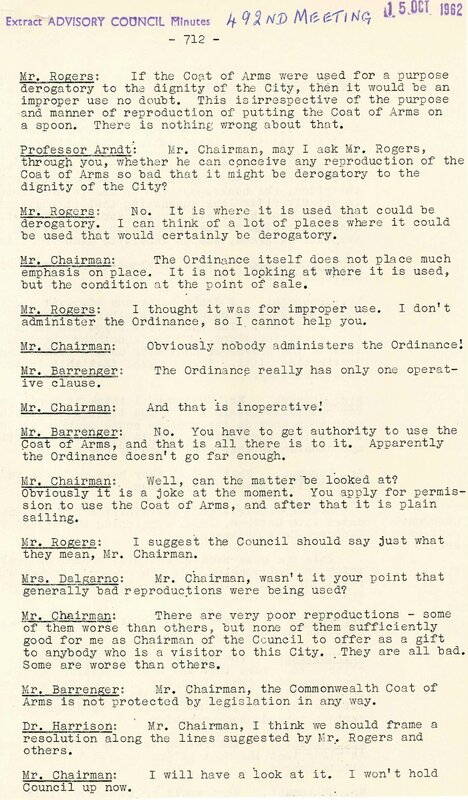 Chairman Byrne believed the purpose was clear: "to ensure that the representations of the Coat of Arms were of a good standard". John Rogers suggested that the purpose was guard against improper use of the symbol, rather than the quality of the reproductions used: "If the Coat of Arms were used for a purpose derogatory to the dignity of the City, then it would be an improper use no doubt. 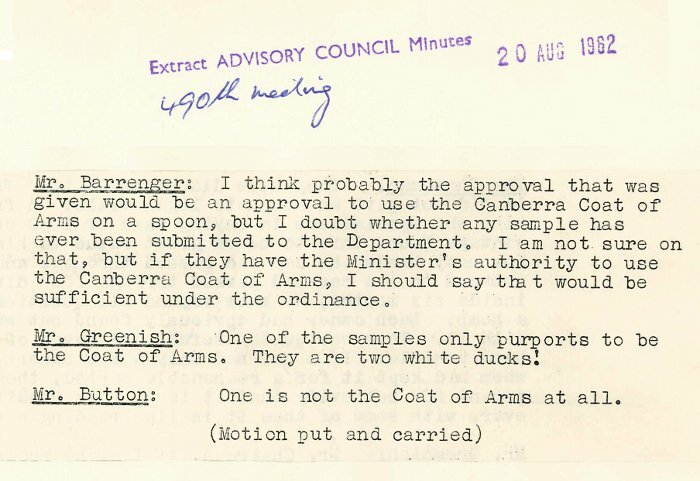 This is irrespective of the purpose and manner of reproduction of putting the Coat of Arms on a spoon. There is nothing wrong about that." The Canberra Times noted back in April that that were no teaspoons on offer among the official Centenary of Canberra merchandise, although there are some very fine tea towels. It may be comforting to know that we could, though, have a teaspoon depicting our Coat of Arms, without offending the dignity of the City.